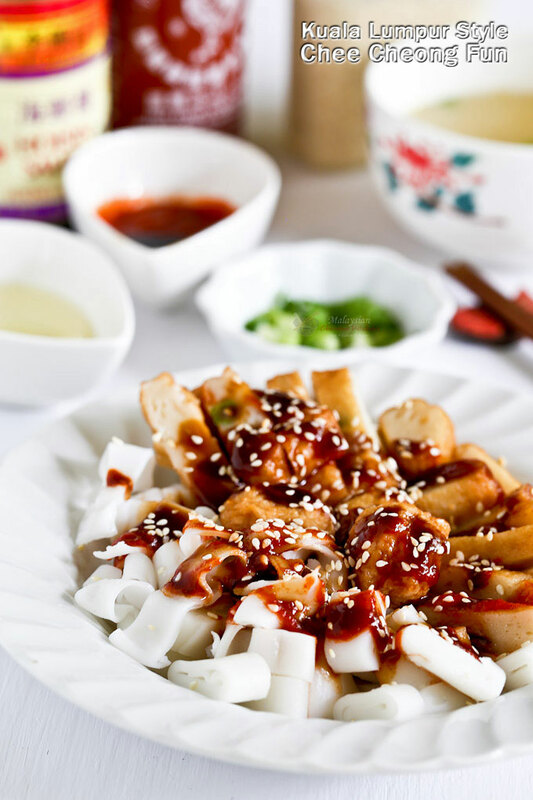 Easy to put together Kuala Lumpur Style Chee Cheong Fun using prepackaged ingredients. So delicious and it takes only 20 minutes to prepare. 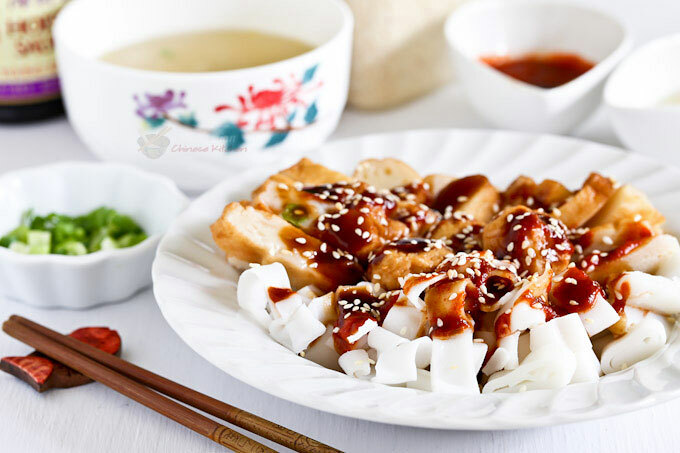 Chee Cheong Fun was brought to the shores of Malaysia by 19th century Chinese immigrants from Guangdong. It is a popular street food that quickly attracted a following among other Chinese dialect groups. 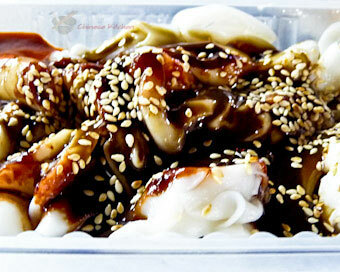 In its original form, Chee Cheong Fun was served with soy sauce. 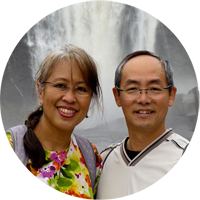 Over time, the sauce became more varied in different parts of the peninsula. In Penang, the local favorite hei ko (shrimp paste) based sauce emerged. A sweet bean paste sauce predominates in Kuala Lumpur. Other variations include a soupy curry sauce. Eventually, other ingredients like fish cakes and fish balls were added most likely due to the influence of the Hakka communities around Kuala Lumpur and Ipoh. Since Malaysians love spicy food, chili sauce and pickled green chilies are available option. For the purest, the original form of Chee Cheong Fun can still be found in most dim sum restaurants. These usually come with a choice of Char Siu or shrimp filling. Making Chee Cheong Fun from scratch can be a tedious process. It involves steaming a rice flour based mixture into thin sheets which are then rolled into a tube resembling intestines, hence the name chee cheong fun. The word fun means noodles in Cantonese. Fortunately, today prepackaged fresh rice rolls are available at many Asian grocery stores. It tends to harden with refrigeration but steaming it for a few minutes will make it soft again. Kuala Lumpur Style Chee Cheong Fun with fish cakes and fish balls is a very popular street breakfast in my hometown. They are often sold by moving vendors at the market place or street corners. I am beyond thrill to be able to recreate it quickly and successfully using prepackaged ingredients found here in Minnesota. The taste of the fish cakes and fried fish balls are surprisingly similar to the ones in Kuala Lumpur. For the sauce, I used hoisin and Sriracha hot sauce directly from the bottle. I think both are just fine the way they are. In my opinion, it is not necessary to add more ingredients to them. Prepare a steamer. If you are using a metal rack, brush a little vegetable oil on the rack to prevent sticking. Place fresh rice rolls in the rack and steam for 5 minutes to soften and heat through. Scald assorted fish cakes and balls in a large pot to remove excessive oil. Remove and cut into smaller pieces. Bring chicken broth to a boil. Add scalded fish cakes and balls. Season with salt and allow it to simmer gently while waiting for rice rolls to heat through. Cut 2 to 3 strips of (chee cheong fun) rice rolls into ½ inch thick pieces. Place in a shallow bowl to one side. Then cut a few pieces of fish cakes into strips and place side-by-side with the rice rolls. Also add a few fish balls to the mix. Drizzle about 2 tablespoons hoisin sauce, 1 tablespoon of Sriracha hot sauce, and 1 tbsp shallot oil onto the rice rolls and fish cakes. Then sprinkle about 1 teaspoon of toasted sesame seeds all over the rice rolls and fish cakes. Serve immediately with a bowl of soup sprinkled with sliced green onions. The soup is usually enjoyed by pouring it into the shallow bowl to mix with any remaining sauce once the rice rolls and fish cakes are eaten. 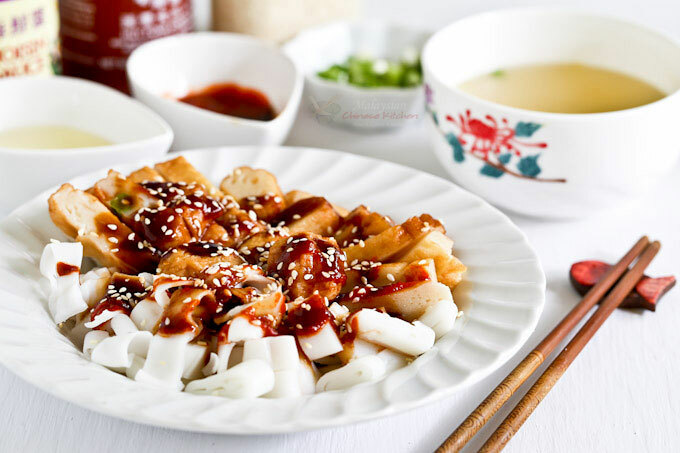 Be sure to mix the leftover sauce on your plate or bowl with some soup after you are done eating the Chee Cheong Fun and slurp it all up. It is so delicious and satisfying! Do give it a try.